We offer timely diagnosis and remedy for every speech, language and communication disorder. It provides speech and hearing solutions that bring back the joy of sound to those with hearing loss or speech-language impairment. Comprehensive speech, language, and cognitive-communicative evaluations. Individual and group therapy for children and adults with disorders of articulation, fluency, voice, language, and/or cognitive-communication. Individual therapy for speech-language disorders following a stroke, brain injury, or laryngectomy. Augmentative communication device training (for individuals with limited or no speech). "Parent training is offered for those who want to learn how to facilitate their children's speech and language development at home." 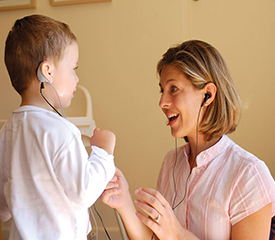 Special auditory testing including tympanometry and acoustic reflexe. Hearing aid consultations, evaluations, fittings, and dispensing. New born hearing screening programme.